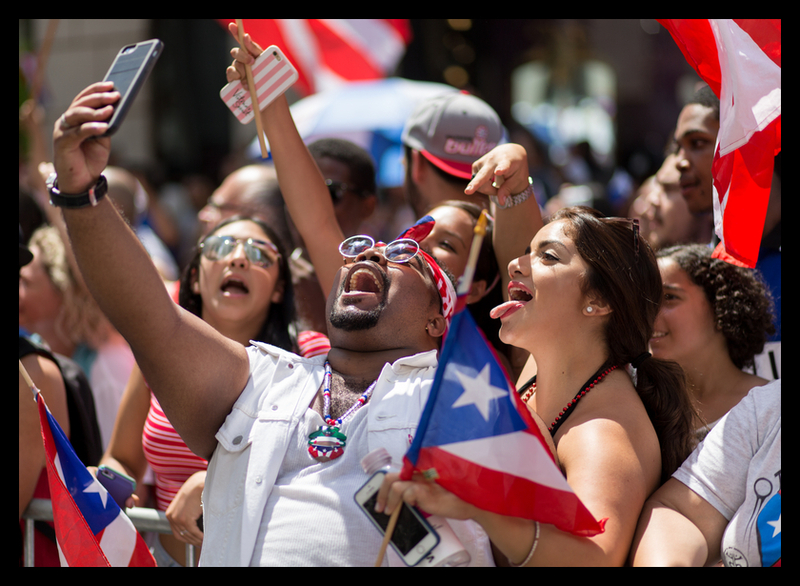 If you're into red, white and blue, the Puerto Rican parade is your thing. 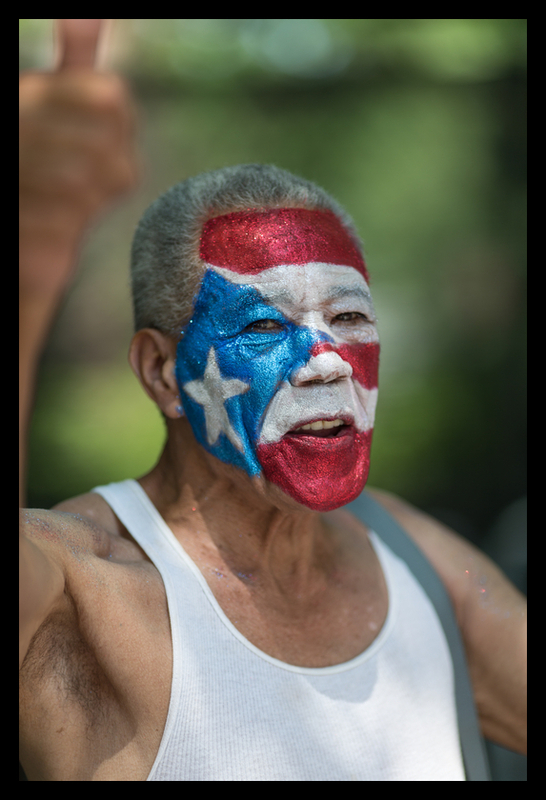 Sunday, I spent once more several hours amidst the Puerto Rican crowds with their colorful flags, clothing and national pride to photograph the annual parade marching - dancing, actually - up Fifth Avenue in New York. 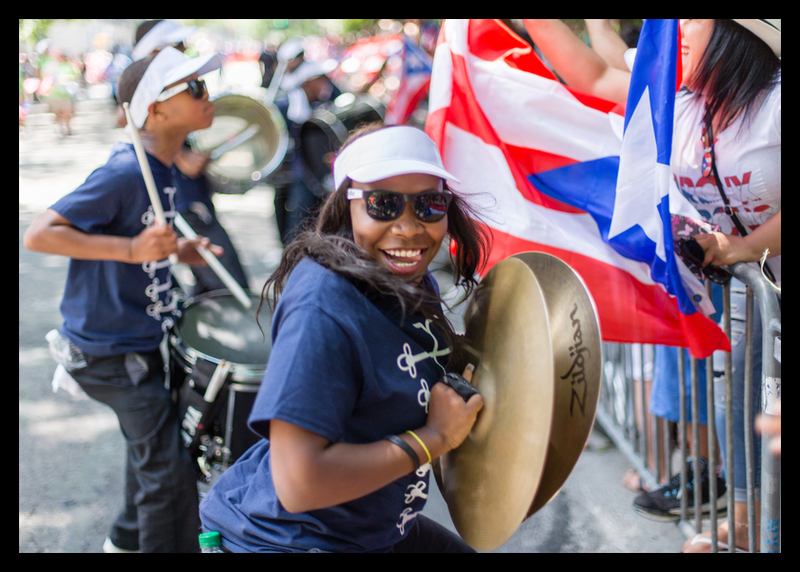 Last year, I wrote at length on how to photograph this parade and what to keep in mind. Most of that stands unchanged. If anything, this year the sun bearing down on the avenue made photography even more interesting or challenging, depending on your take. I found myself looking for shadows of dancers, whenever the sun was out. When a cloud moved in front of it, I sometimes missed a nice opportunity, but at the same time was relieved by the temporary shade. The main difference this year was that I started at the very beginning of the parade, both in time and in location. 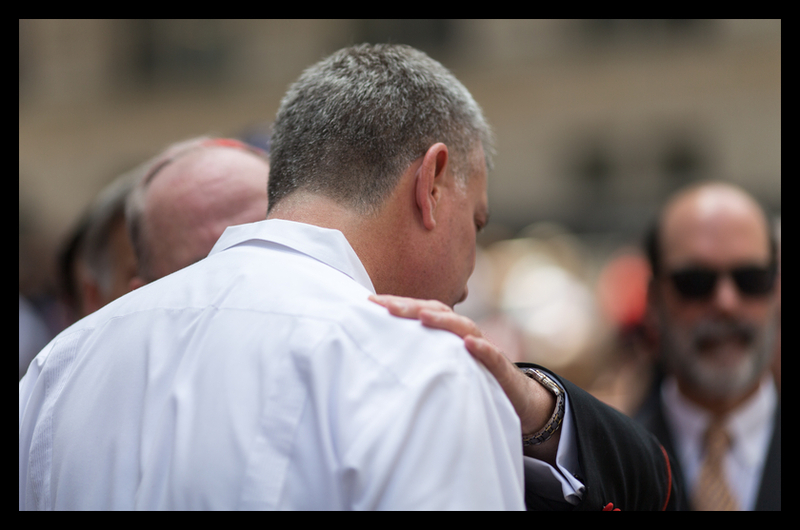 This meant that I walked by the setup for Cardinal Timothy Dolan in front of St. Patrick's cathedral, where he greets the parade. It also meant that I saw how the day progresses, with the official early part of the parade - think the mayor's office marching without any music - making place for the hip-hop part, a loud party that attracts the real crowds. Since I usually arrived late, I never noticed that early on the crowds are thin and participation is relatively lackluster. By Puerto Rican standards, that is. I also noticed just the sheer size of this parade. They started off around 11 AM at the corner of 44th and Fifth. By the time I was back at the start, now moved to 48th Street, new floats were still entering the parade. That was at 3.30 PM, more than four hours after the first people started off. This year I again used an Olympus OM-D E-M1 with Olympus 12-40mm f/2.8 PRO lens, a good combo for general shots. I did still miss the Olympus 7-14mm for wider shots, which has been announced but won't ship until at least next week. Instead of another E-M1 like last year, I brought the Canon 1D X and the Canon 50mm f/1.4, 85mm f/1.8 and 135mm f/2 lenses. Since I liked the results of using the 135mm at the dance parade, I decided to try the same thing with isolating people, but since I didn't know which lens would be best, I took all three. 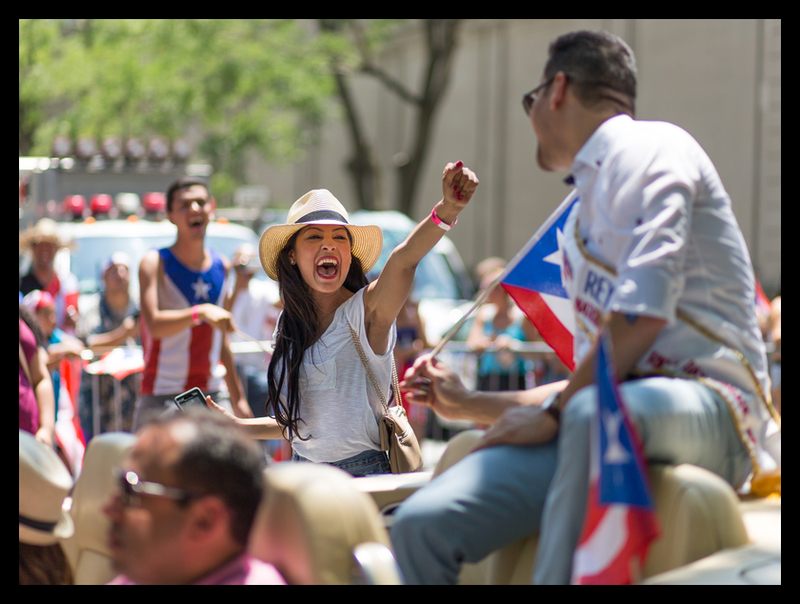 Generally, the 135mm was a bit too long this time around, because I was so much closer to the crowd and the parade. The 50mm and the 85mm worked fine, though. Looking back at the results, the 50mm sometimes had trouble locking AF as quickly compared to what I'm used to with the 1D X.
Photographing this parade remains fun and rewarding, but also quite tiring. It's extremely loud and gets extremely crowded. It's hot and unless you don't mind having the same background in all your images, requires you to do quite a bit of walking, more so if you don't have a parade pass. You must be comfortable in boisterous Hispanic crowds. Judging from the white passersby I see every year attempthing to evade the crowds, many people don't. Still, if for you the pros beat the cons, go for it. In New York, you generally don't run into people you know. But things are getting eerie. I photographed this woman last year as well. And I noticed a policewoman that I also saw last year and gave my business card to a cop whose picture I had taken at the recent NY Dance Parade.